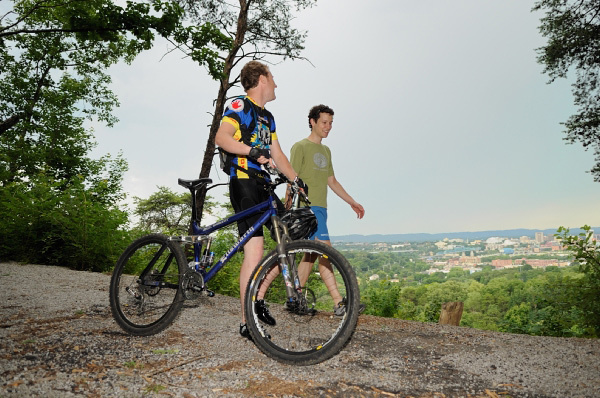 The four wooded hilltops of Stringer's Ridge rise above the city, their oaks and hickories threaded with walking paths and mountain bike trails. Where soldiers clad in blue bombarded the city in the Battle of Chickamauga, fitness fans now hike and pedal in multi-hue sportswear. In 2007, developers announced plans to construct 500 condominiums on 92-acres along Stringer's Ridge overlooking downtown Chattanooga. As word spread that the city's green backdrop would soon disappear under six-story structures, the community rallied and turned to The Trust for Public Land to help save the historic landmark. While the development proposal was withdrawn in the face of local opposition, the land remained unprotected. In the fall of 2008, we launched a campaign that would eventually protect all 92 acres of the ridge. In fall 2013, the park opened to the public. In 2018, we conserved land that will become a one-mile connector trail between Stringer's Ridge Park and the community of Red Bank. When complete, the trail will replace the existing, dangerous on-street bike route through a narrow tunnel.